A couple of weeks back I missed out on an excellent mullet fishing session because I had to pay a visit to one of my sons. My pals Nigel and Brian managed to capitalise on the information and had a wonderful session. On the recent set of spring tides I was determined to make up for the deficiency. I'd had a recce two days earlier to see where the weed and maggots were accumulated (not a sign of a fish incidentally). The weather was flat calm and everything looked just right. I'd had a word with Nigel and we arranged to meet at a potential hot spot. When I got to the car park Nigel's car was already there and he had clearly beaten me to it so I grabbed the rods (fly and spinning) and set off on the longish walk to our chosen pitch. As I hopped along the rocks I was really optimistic, for once everything looked right. Soon I saw my pal in the distance and he was already fishing. My pace quickened. As I approached he said that he'd already landed a mullet - better and better! 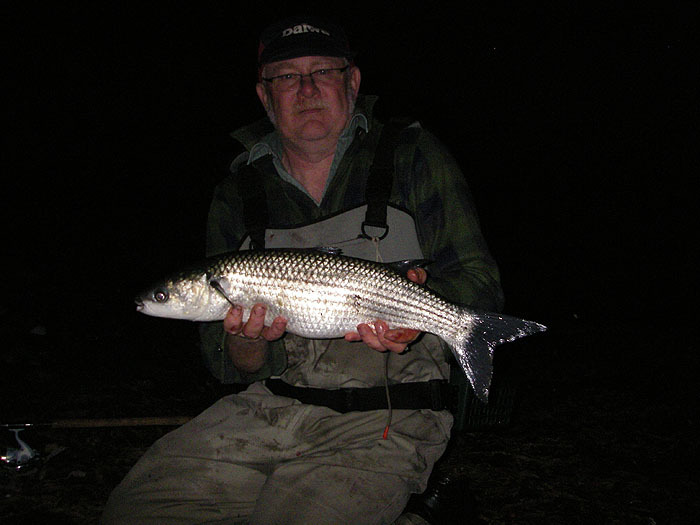 I was fishing with my usual 8wt fly rod, floating line and six pound nylon cast armed with a poly-maggot fly and a few wriggling white maggots. 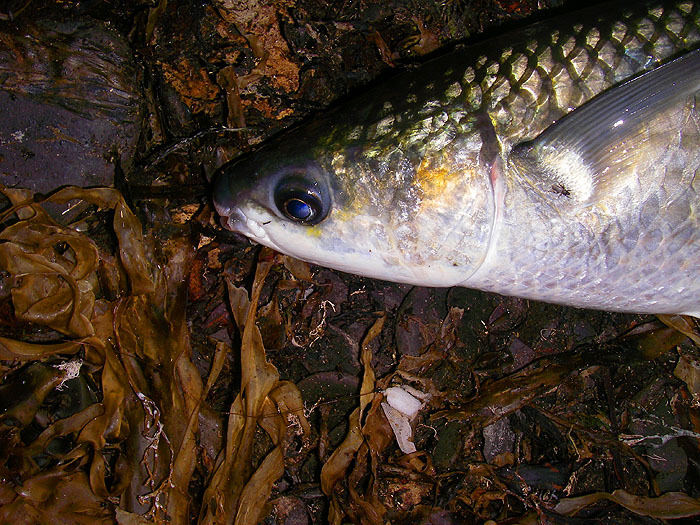 The mullet were there in force, cruising round on the surface in compact groups, often no more than a metre or so from the water's edge. I sat down on a pile of old weed and flicked the fly out to a group of fish - they were so close that there was no more than a couple of metres of fly line outside the rings. I slowly raised the rod, watching the bow in the line intently. It twitched. I struck. 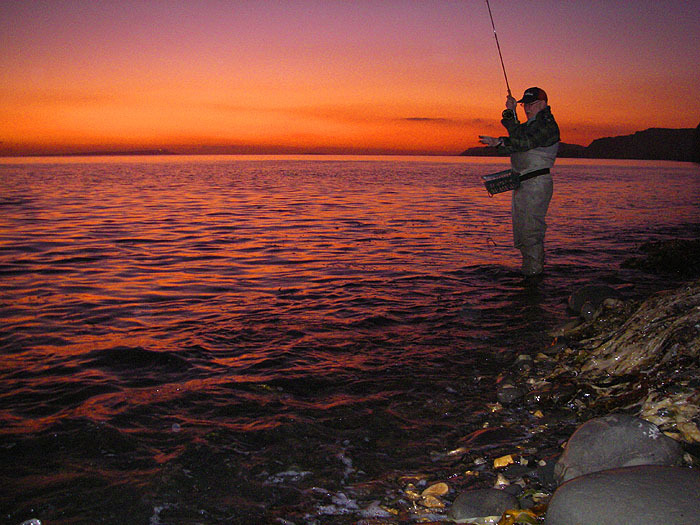 The line tightened and the reel screamed - I was in. Within a few seconds the line was down to the backing but then there was a pluck and it fell slack - the hook had pulled. Reel in quickly. Bait the hook with a few fresh maggots from the handful in my pocket (no time to fiddle about with the box) and cast again, nothing! Another gentle flick. Wallop! I'm in again. This time the fish really wanted to go places. I staggered to my feet slipping and sliding on the piles of rotten kelp. 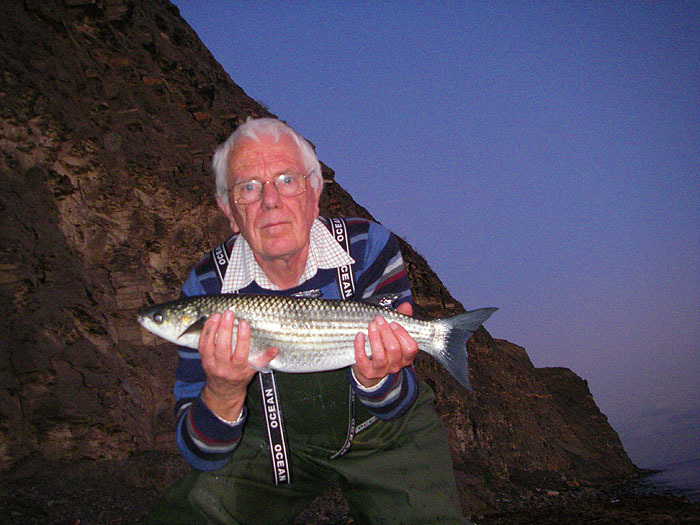 The mullet, having gone straight out to sea at first, had turned and was zipping along the shore. I followed as best I could gaining a bit of line whenever possible. It must have been ten or fifteen minutes and numerous long runs before my fish was wallowing in the breaking waves at the edge. I grabbed the trace to slide it ashore (I never bother with a net), the hook popped out and it swam away. Phew!!!! Tramp back along to the feeding fish. Bait the hook again. Cast out. Hook another good fish. 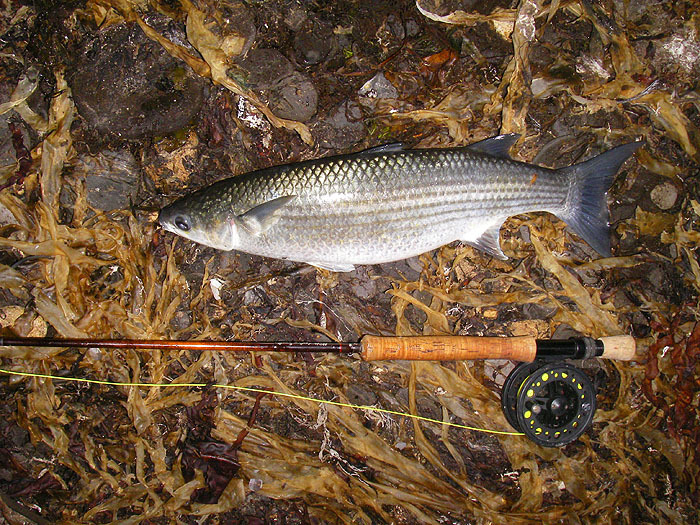 This time, after another long struggle, I land a six pounder and take its picture before returning it to the sea. A couple more casts, a missed bite, a lost fish and then the whole excercise is repeated. This one's just over six pounds. I use the time-delay on the camera (I know how to do it now) to take my own picture with it. Again I lose a fish after playing it for a while then I land another probably a few ounces less than the first one. By now it's getting dark. The fish are still there but I have to go for home my dinner. Nigel's just landed yet another six pounder so I take his picture then I gather up the gear and leave. What a session. Must try to go again tomorrow. A big fish for Nigel.